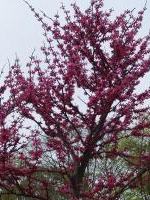 Beautiful selection of our native Eastern Redbud bearing electric pink flowers along its branches in early spring. Typical heart shaped foliage. Grows 20-30 ft.